Known as the "Church of Holy Wisdom", the Haghia Sophia is a stunning architectural achievement by today's standards. 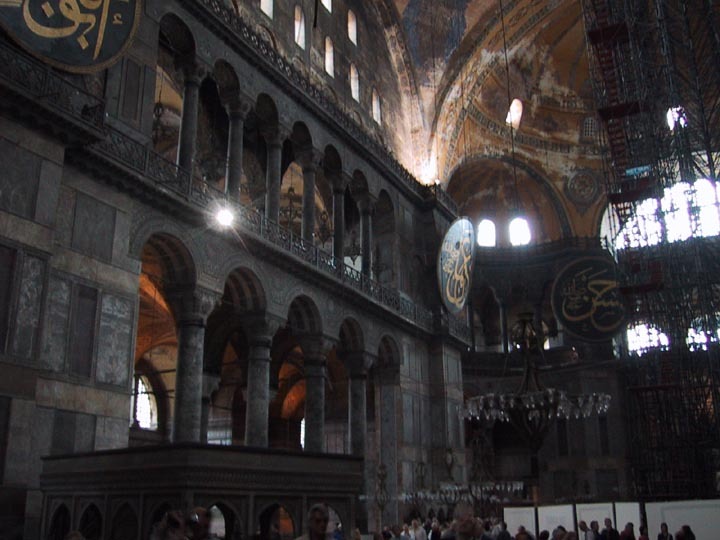 The fact that it was built in the 6th century and is now 1,400 years old is awe inspiring. The version that stands today was primarily built in 537 during the reign of Justinian I (a busy fellow, that Justinian, building cisterns, churches, you name it). Just after entering the grounds of Haghia Sophia, it looks more like a park than a cathedral grounds. The entrance is ahead on the right. 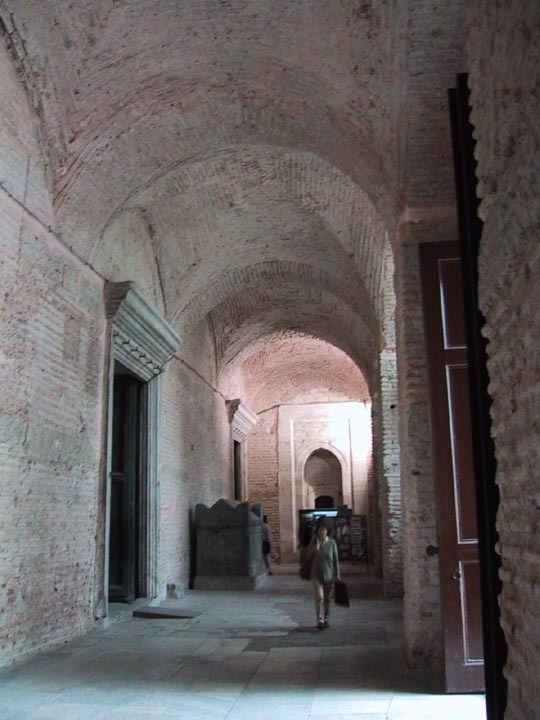 Just after stepping through the entrance way to the cathedral, this is a look up the outer narthex. 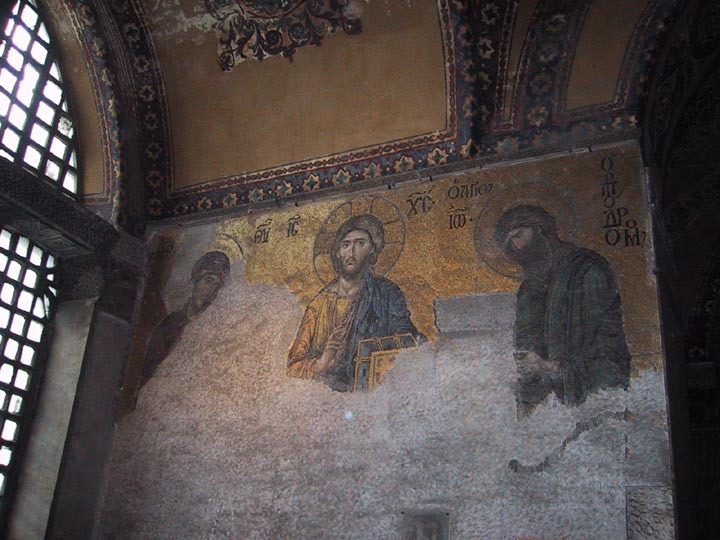 Stepping into the inner narthex, we are confronted with the first of many mosaics in Haghia Sophia. 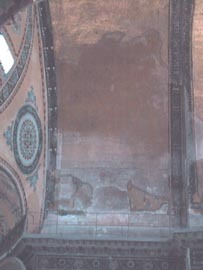 This one is of Emperor Leo VI prostrate before Christ. 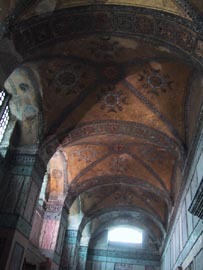 The ceiling of the inner narthex still has much of the original 6th century mosaic. 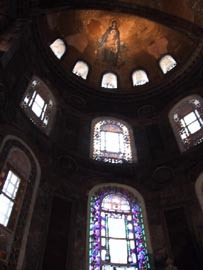 The site of the Haghia Sophia actually had several churches built on it, some of which even had the same name as the current one - nothing remains of the 4th century church, but there are parts of the 5th century still standing. The most impressive parts of Haghia Sophia are 5th century, although the Ottomans, a thousand years later, would add a number of buildings, structural reinforcements and such to keep the building standing. 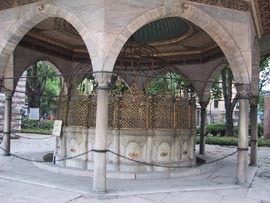 The Ottomans are also responsible for converting the cathedral into a mosque, adding minarets, tombs and fountains. Stepping into the main chamber of the Haghia Sophia, known as the Nave. 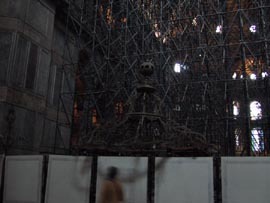 The huge lattice structure on the left is a scaffolding that has been in the church for the past six years. 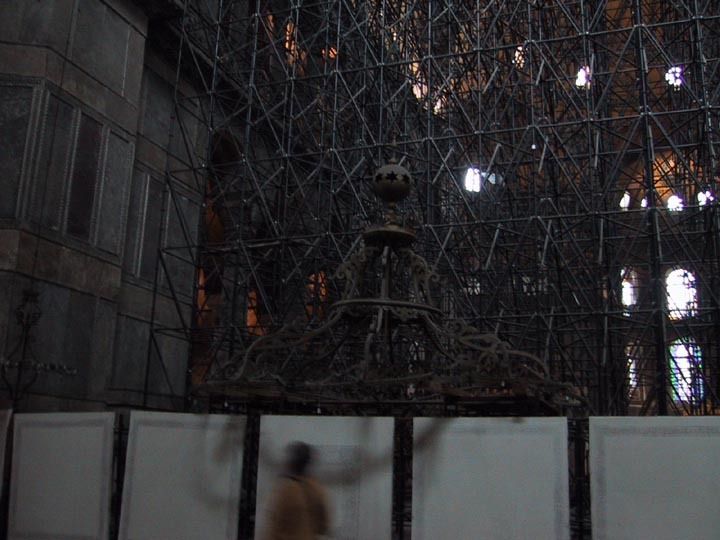 In front of the scaffolding is the massive chandelier that normally hangs from the center of the dome. 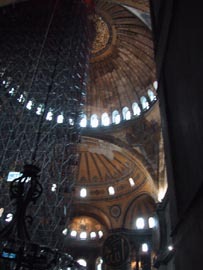 Looking straight up toward the dome, some 180 feet up. 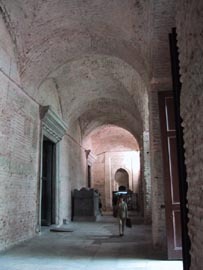 The southern wall of the Nave - the arches in the middle are the gallery level. 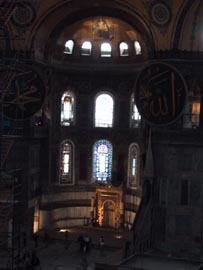 Looking at one of the alcoves in the Nave - the large roundels were added in the 15th century when the cathedral was converted to a mosque. 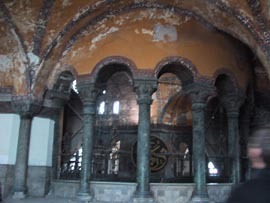 Looking at the Apse, where the altar would have stood (if this was still a church), but now houses a mihrab. 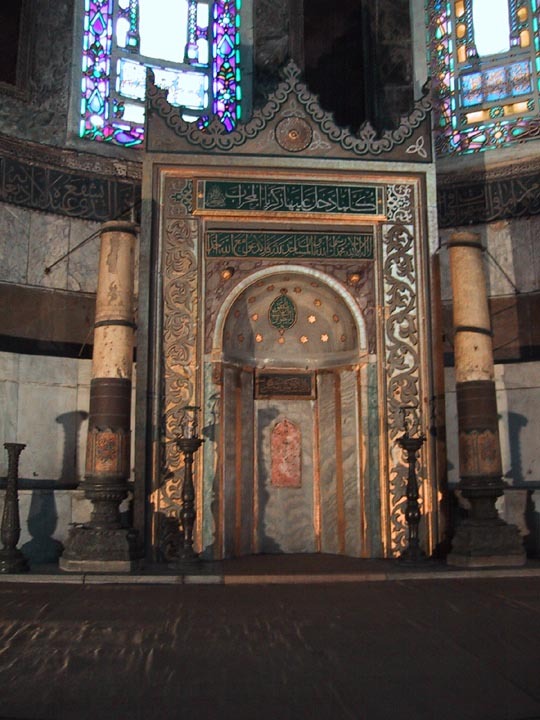 A close up of the mihrab in the Apse of Haghia Sophia. 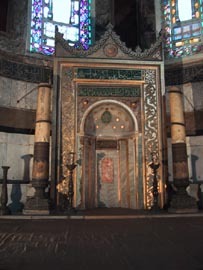 The mihrab points toward Mecca, towards which all Muslim worshippers must pray. 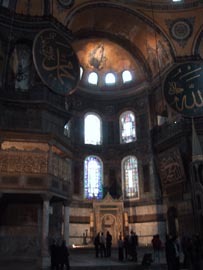 Looking up from the mihrab into the Apse, a huge mosaic of the Virgin Mary with the infant Jesus on her lap stares down, as it has for more than 1,400 years. 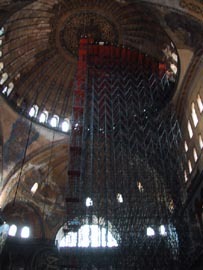 Turning around from the mihrab and looking up, you get a good look at the scaffolding in the Nave. This scaffold is used to get access to the most damaged parts of the dome, repairs and restoration are taking place. 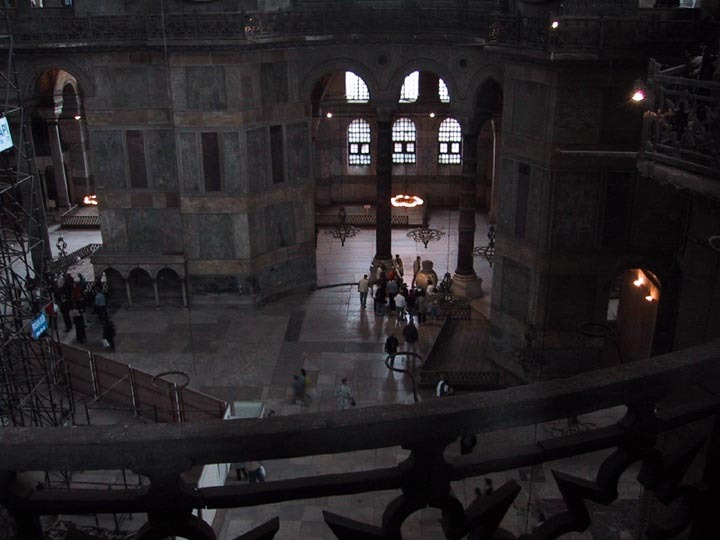 Turning further left and down from the previous picture, you can see the main floor and gallery of the southern and western parts of the Haghia Sophia. 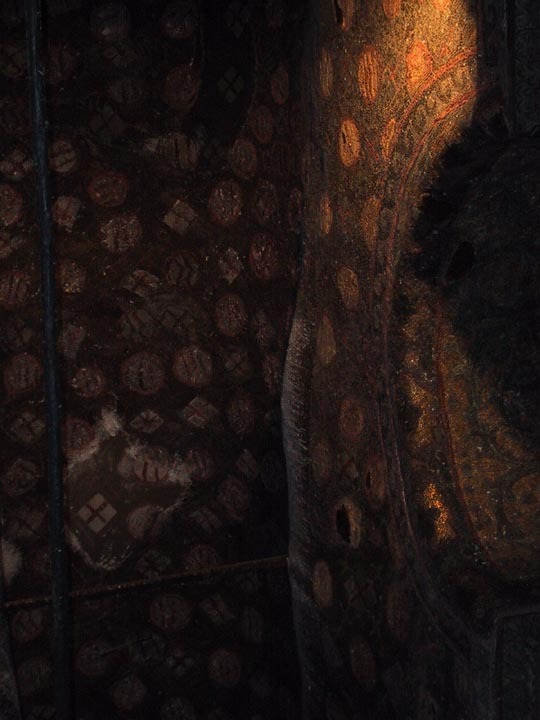 Every corner of the church has an alcove, and a pair of roundels bracket each alcove. 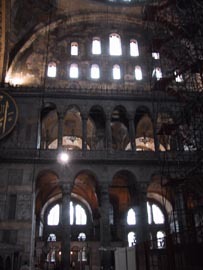 In the southeast corner of the Nave is the pillar of St. Gregory the Miracle Worker. 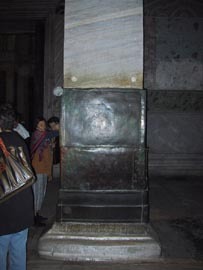 The pillar is wrapped in bronze, and is believed to have healing powers. 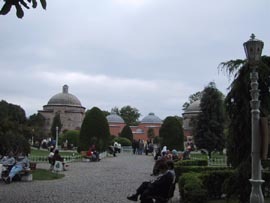 It was surrounded by school children and tourists the entire day. 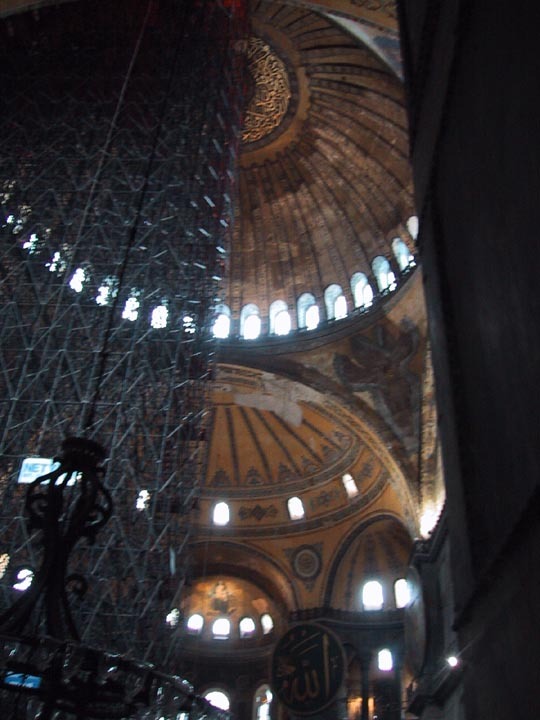 Our exploration of the main floor completed, we headed up a ramp from the inner narthex, up to the gallery level. 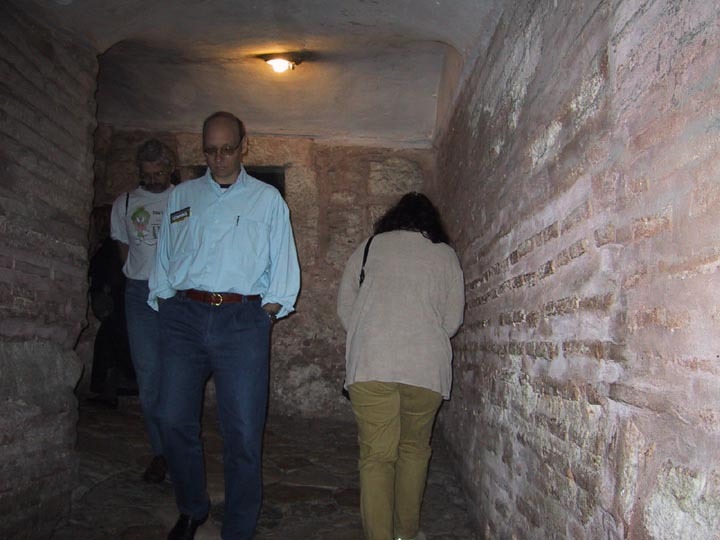 Rather than stairs, this is a ramp, just a sloping floor of mortared stone going round a central pillar. 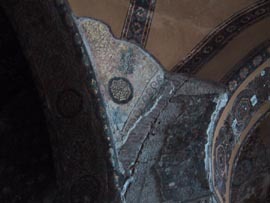 When the Ottomans converted the Haghia Sophia to a mosque, they covered over a large number of mosaics - in the Muslim faith, mosques cannot have pictures of living things; they are normally covered in designs. 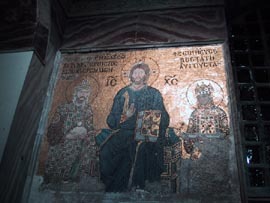 The mosaics violated this tenet, and so they were plastered over and typical (and beautiful) designs were painted on the plaster. 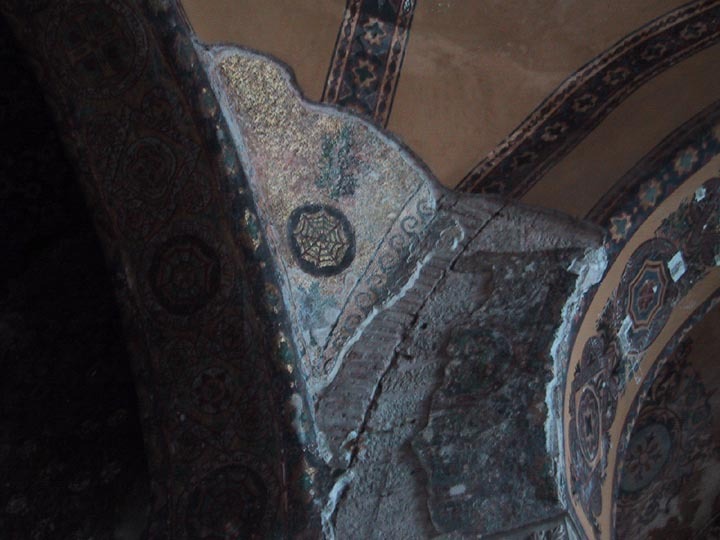 This plaster is now some 500 years old, and is coming off. And Haghia Sophia is no longer a functioning mosque, although it still has all the trappings of one. However, there is now an interesting juxtaposition to deal with - while certainly the 5th century mosaics of the original Haghia Sophia are well worth restoring and preserving, many of the 15th century Ottoman-era conversions are now priceless artifacts too - such as the top of the dome covered in Koranic inscription and the roundels. 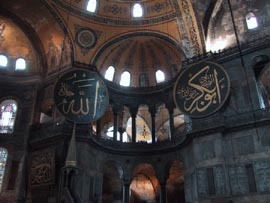 Haghia Sophia shows its wear and the combined restorations - both Islamic and Christian. 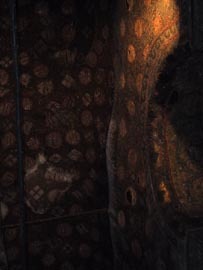 Reaching the top of the gallery ramp, looking at the inside of one of the alcoves. 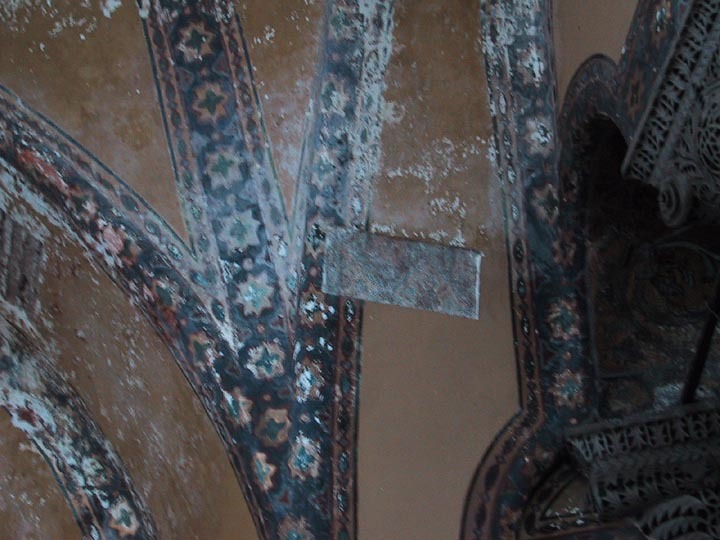 You can see clearly here that paint and plaster have been falling away. Looking down from the alcove into the Nave, visible in this picture is one of the two huge marble vases that stand in the corners of the Nave. 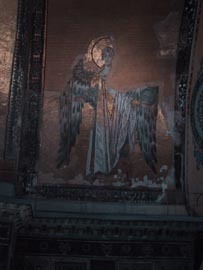 From the gallery looking across the Aspe at a mosaic of the archangel Gabriel. 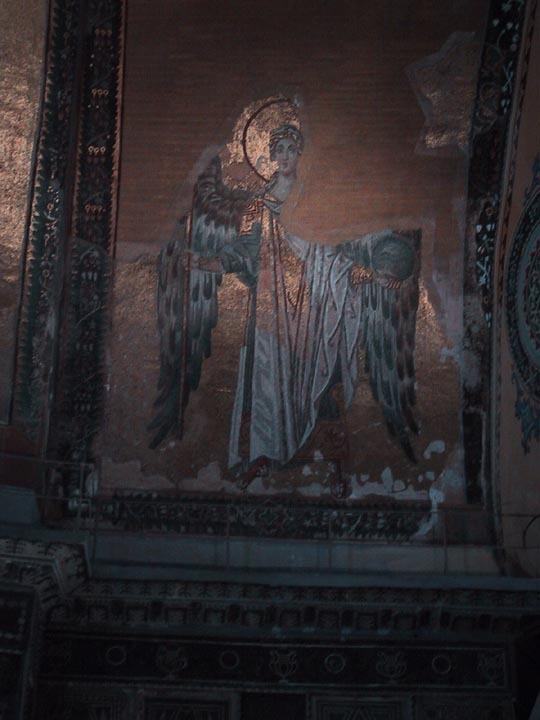 On the opposite side of the Aspe was a mosaic of the archangel Michael, but it is almost totally lost. 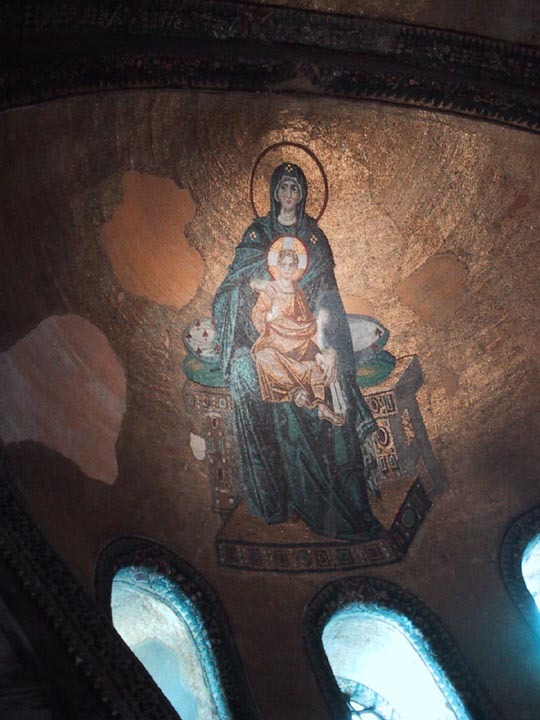 A close up view of the Mary and infant Jesus mosaic at the center of the dome of the Aspe. This mosaic and those of the archangels Gabriel and Michael are documented as being unveiled in 867 to celebrate victory over the iconoclasts. 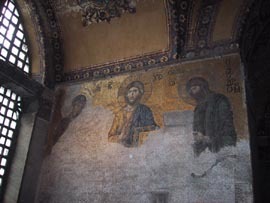 In the south gallery is the remains of a mosaic called the Deesis Mosaic, showing the Virgin Mary, John the Baptists and Jesus the Pantocrator (the All-Powerful). 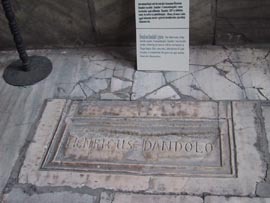 Across the gallery from the Deesis Mosaic is the tomb of Enrico Dandolo, also known as the Doge of Venice, he was responsible for the sacking of Constantinople in 1204. 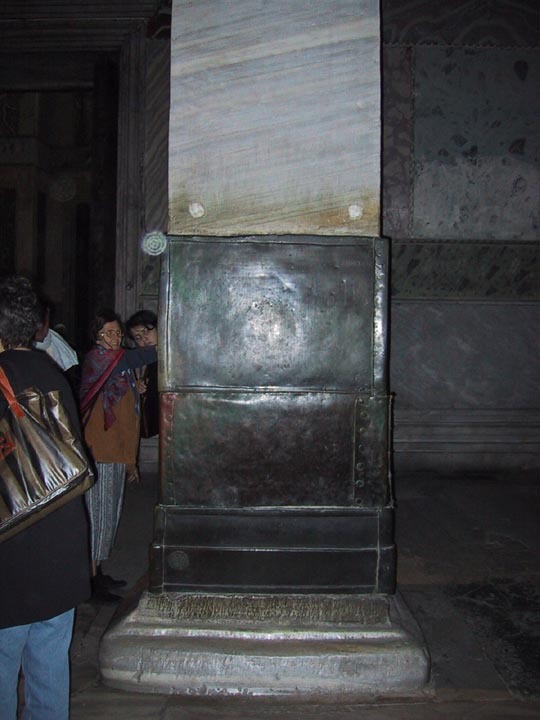 A year later he died and was interned in the Haghia Sophia. Sixty years later his grave was opened and bones thrown away. 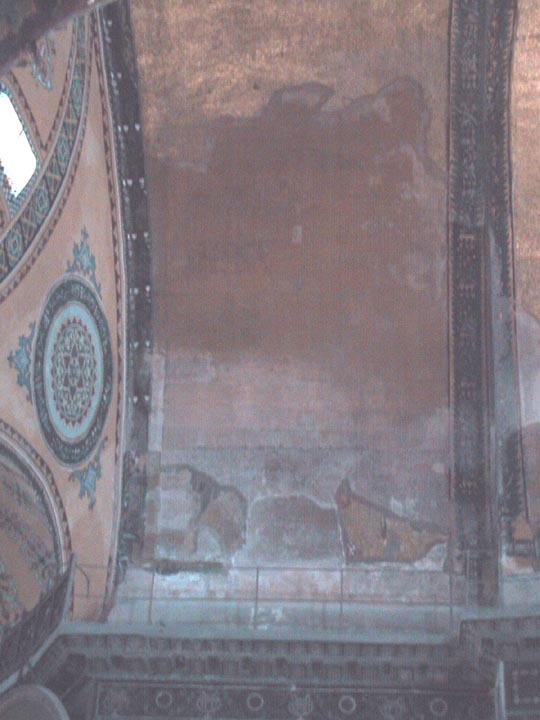 In a gallery in the southeast you can see where work is ongoing, removing the 15th century plaster of the Ottomans to reveal the mosaic work of the 6th century. 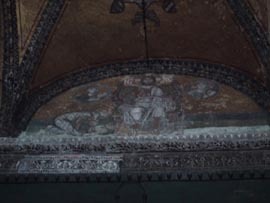 Here is an even more clear example of the plastering that took place - a square of plaster removed nearly an inch think to reveal the remains of mosaic work underneath. Looking down from the south gallery is the Sultan's Loge, where the Sultan and his entourage would go for prayer in Haghia Sophia, when it was a functioning mosque. 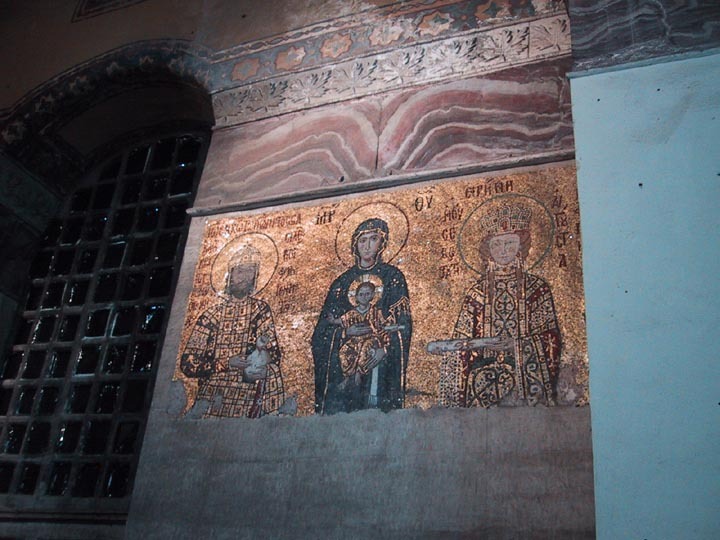 Mosaic of the Virgin and infant Jesus with Emperor John II Comnenus and Empress Irene. 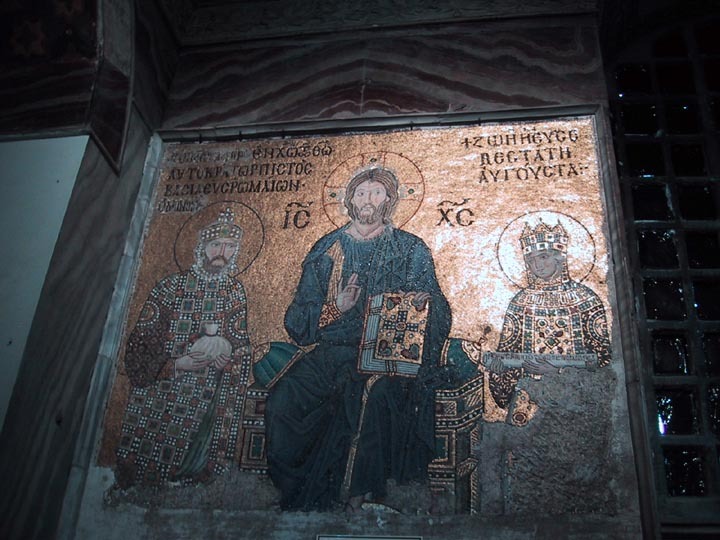 A short distance away from the previous mosaic is a similar scene, this time the adult Christ with Emperor Constantine IX Monomachus and Empress Zoe. 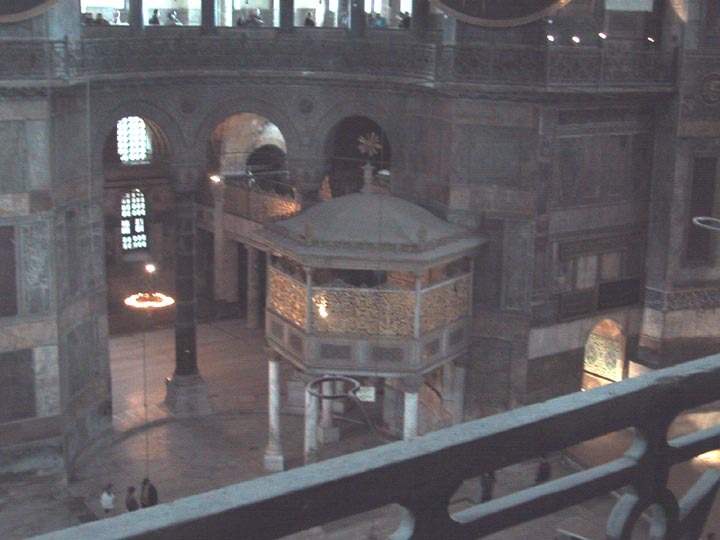 Looking down from the west gallery at the entire Aspe, from mihrab to mosaic. 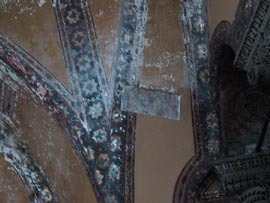 A section of the ceiling of the north gallery, showing where some mosaic has been revealed from the plaster - the mosaics are in glittering gold. 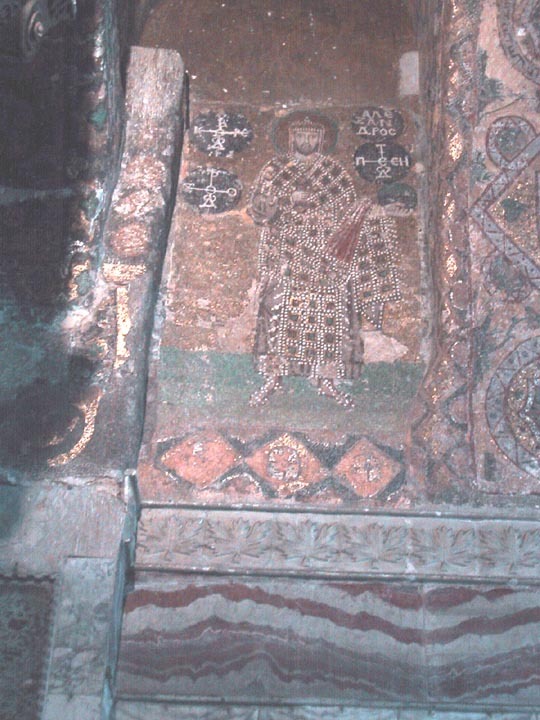 A recently revealed mosaic of Emperor Alexander, holding a skull. 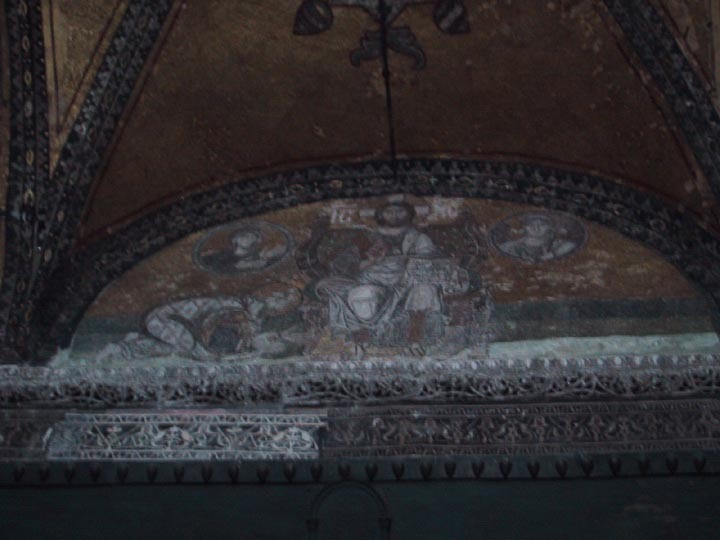 As we were leaving the Haghia Sophia, we went through the Vestibule of the Warriors. 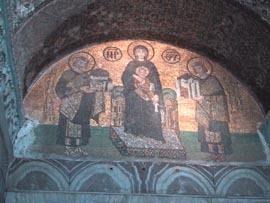 Above the doorway is a mosaic of the Virgin Mary and infant Jesus, flanked by Constantine, on the right, presenting Mary the city of Constantinople. On the left is Justinian offering the Haghia Sophia. 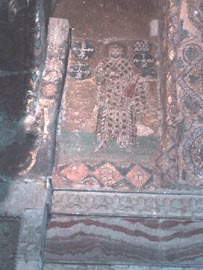 Likely this mosaic was made long after the men died, like in the 10th century. 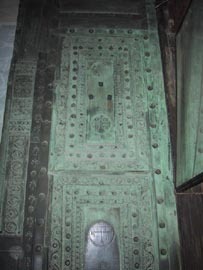 The door to the Vestibule of the Warriors is made of bronze. 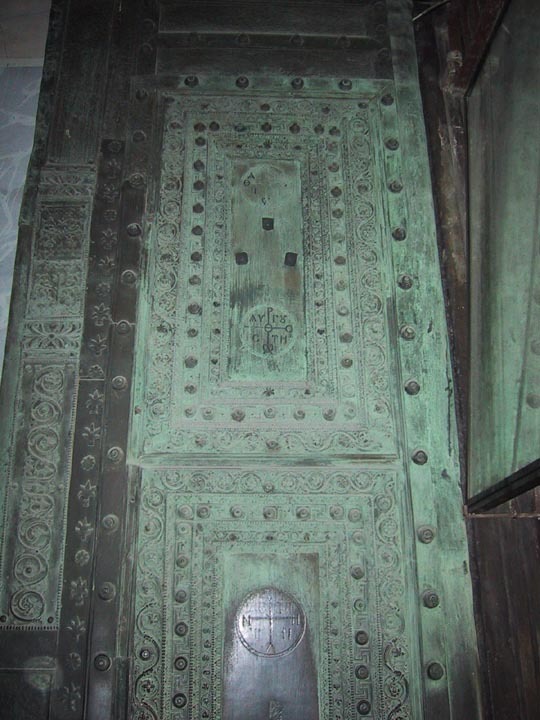 The door originates in Tarus around the 11th century BC, and was brought to the Haghia Sophia by Emperor Theophilus in the 9th century AD. Outside the Vestibule of the Warriors is the Ablutions Fountain, built around 1740. 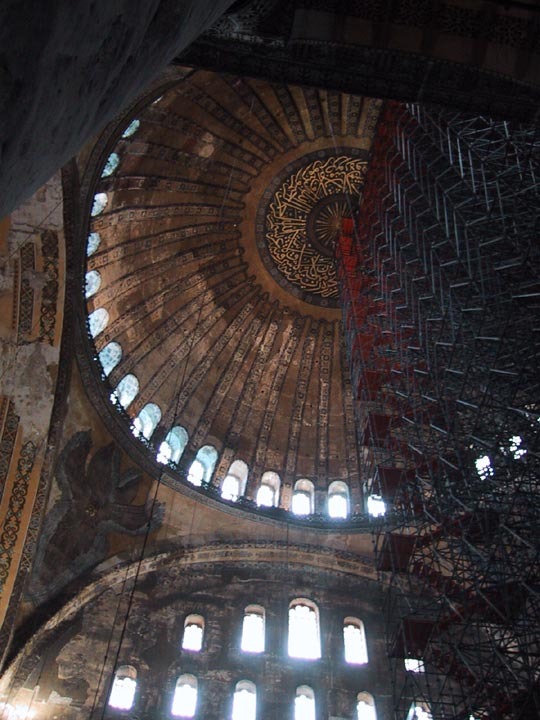 The most amazing thing about the Haghia Sophia is that it exists at all - history shows that when a foreign power conquers a city, especially a power with different religious beliefs, the destruction and replacement of places of worship is an early step to the subjugation of the populous. 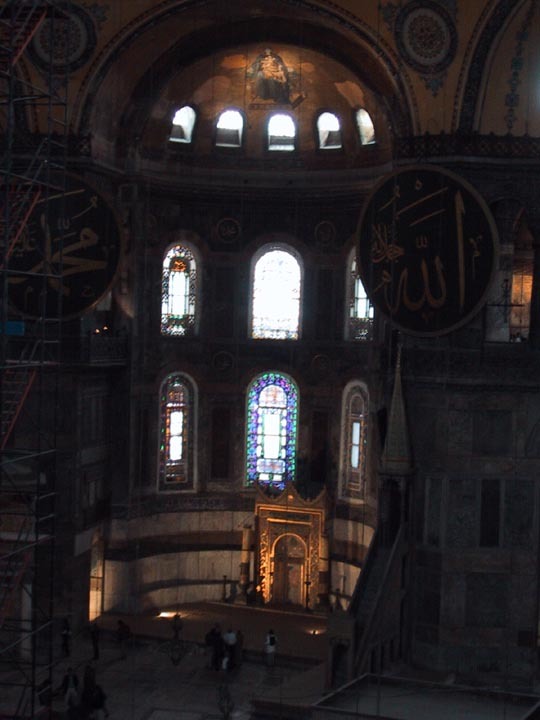 But in the case of the Ottomans and the Haghia Sophia, this did not happen. Its almost as if Mahmet II, the sultan who capture Constantinople and renamed it Istanbul, making the city Islamic instead of Christian, walked into the Haghia Sophia and said "Too beautiful to tear down, repaint it and make it a mosque." Today the Haghia Sophia seems forgotten by the Christian world, although it was once the greatest cathedral - and yet it still stands, straddling the line between Christianity and Islam.